1954-1965 : Studied at the Lycée Molière, in Paris, France. (EHESS), Gérard Nahon (EPHE). Missing David Landes (Harvard). For the first time, Gypsies are singing at the Sorbonne. 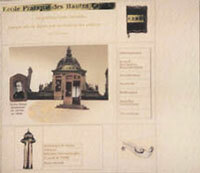 1999 : PhD in History of Religious Sciences, Ideologies and Systems from the Sorbonne (EPHE, salle Marcel Mauss). Doctorate on Edmond de Rothschild (1845-1934), under the direction of Gerard Nahon. The jury (Henry Laurens of the Paris Oriental Institute “Inalco,” David Landes of Harvard University, François Georgeon of the School of Historical and Social Sciences “EHESS,” and the President of EPHE, Jean Bauberot) awarded me the highest honours. Price Zadoc Kahn 2000. Was published in France under the title Edmond de Rothschild. L’homme qui racheta la Terre Sainte ( Rocher), in January 2003. Foreign Languages : fluent English and German, Italian (for reading), Spanish (for reading), Ancient Greek and Latin. November 2001, conception and technical achievement of a Web site for Professor Gerard Nahon, “The Uninterrupted Seminar” : www.antebiel.com/nahon. February 1998 : Conference on « The Life and work of Edmond de Rothschild (1845-1934), Prince in Palestine », at the Franco-German Society, invited by Mr.Hartmann. 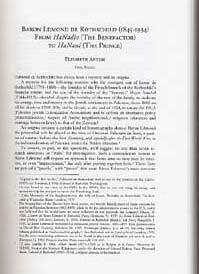 1998 : « Baron Edmond de Rothschild (1845-1934) and the first settlements in Palestine : from HaNadiv (The Benefactor) to HaNassi (The Prince)”, for the 6th Congress of European Association for Jewish Studies in Toledo 1998. 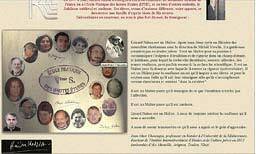 2 001-2003 : Part of a Group of Researchers on the theme How to use the Past, brought together every six months under the direction and on the initiative of Jean-Marc Chouraqui, director of I.E.C.J. (Inter-Universities Institute of Jewish Studies and Culture), at Aix-Marseille University, South of France. June 13-15, 2002 : « The End of the influence of France in Ottoman Palestine (1869-1914) and its consequences», forum on la France et le Levant, June13 to 15, 2 002, Lyon 3-Lyon 2 University, Moslem-Christian Research Institute in Beyrouth. In Beyrouth, Father Olivier Borg-Olivier, s.j., talking with the Maronite Archibishop. « Albert Antébi (1873-1919) ou la religion de la France : Lettres », Diploma from the “School of Advanced Studies” (EPHE) on Albert Antébi (1873-1919) or A true Faith in France’s Universal Spirit, under the direction of Professor Gérard Nahon (Harvard College Library, Judaica Division, Widener Library M : HU HOLLIS# BMP3551 /bks) . With Anne de Boismilon (left. ), who was at the time reporter at ABC, and Sieglinde Hartmann (on the right. 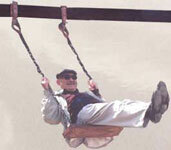 ), Professor and Organizer of the conference. « The End of the influence of France in Ottoman Palestine (1869-1914) and its consequences», forum on la France et le Levant, June13 to 15, 2 002, Lyon 3-Lyon 2 University, Moslem-Christian Research Institute in Beyrouth. 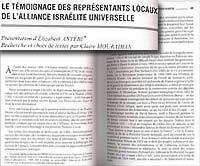 Accounts of the local representatives of Alliance israélite universelle, presentation » in Ailleurs, hier, autrement : connaissance et reconnaissance du génocide des Arméniens, CDJC, 2003, pp. 88-111. "Sylvain Lévi : the dream of a Judaism with no temple, no priest, no book » (conference for the forum on Stakes of History, Games on Memory (Enjeux d'histoire, jeux de mémoire), organised by the Inter-Universities Institute of Jewish Studies and Culture, December 8, 9 and 10, 2 003).